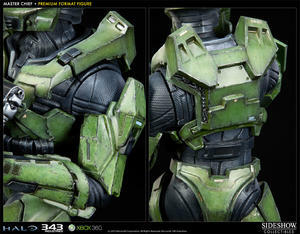 Wrapped in the anonymity of his Mark V Mjolnir combat suit, the hero of Microsoft's Halo series stands vigilant and victorious atop a rocky vantage point in Sideshow Collectibles' Master Chief Premium Format Figure. 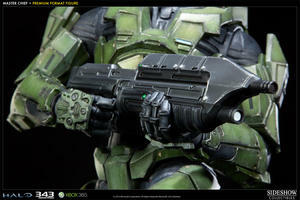 Drawing inspiration from original character designs that were reimagined for 2011's Halo: Combat Evolved Anniversary Edition, Sideshow's artisans developed a figure featuring a modern take on a classic look. 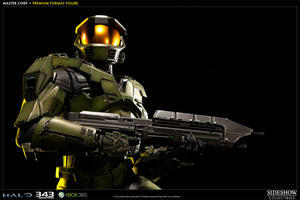 As for the Master Chief's weapons of choice, the figure comes equipped with the first two weapons accessible to players in the game the tried-and-true Assault Rifle, and the insanely powerful Magnum Pistol. 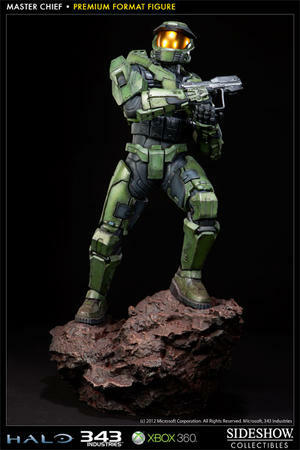 Standing at an impressive 25 inches in height, the Master Chief Premium Format Figure is a massive memorial to Halo games of the past and a forerunner of future fights to be finished.